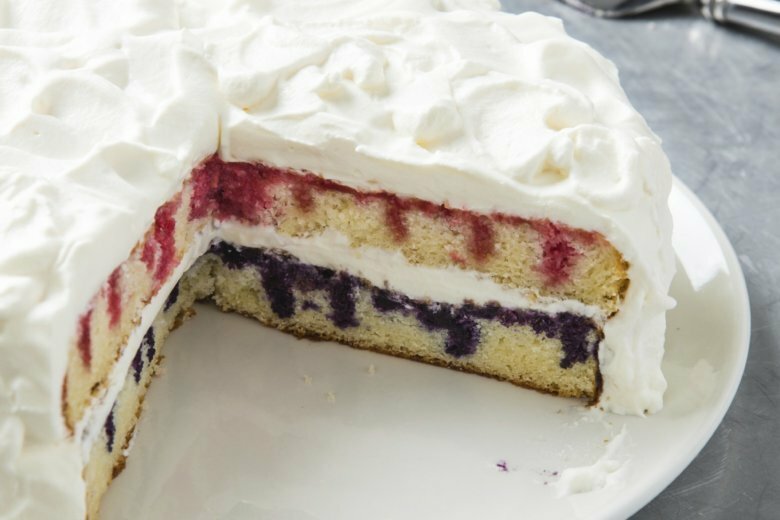 For a cake that was red, white, and blue all the way through, we started by cooking blueberries and strawberries and then combining each with gelatin to create two colorful, brightly flavored syrups. We used a simple white cake as our base; it was tender and flavorful but also had enough structure to handle a syrup soaking. We used a skewer to poke holes into the cake layers while they were still in their pans and then drizzled the blueberry syrup over one layer and the strawberry syrup over the other. A simple filling and frosting of whipped cream kept this cake light and refreshing for the summer holidays. Adjust oven rack to middle position and heat oven to 350 F. Grease two 9-inch or three 8-inch round cake pans, line with parchment paper, grease parchment, and flour pans. Whisk milk, egg whites, and vanilla together in bowl. Using stand mixer fitted with paddle, mix flour, sugar, baking powder, and salt on low speed until combined. Add butter, 1 piece at a time, until only pea-size pieces remain, about 1 minute. Add all but ½ cup milk mixture, increase speed to medium-high, and beat until light and fluffy, about 1 minute. Reduce speed to medium-low, add remaining ½ cup milk mixture, and mix until incorporated, about 30 seconds (batter may look curdled). Give batter final stir by hand. Divide batter evenly between prepared pans and smooth tops with rubber spatula. Gently tap pans on counter to settle batter. Bake until toothpick inserted in center comes out with few crumbs attached, 23 to 25 minutes, switching and rotating pans halfway through baking. Cook blueberries, 3/4 cup water, and 2 tablespoons sugar in medium saucepan over medium-low heat, covered, until blueberries are softened, about 8 minutes. Strain mixture through fine-mesh strainer into bowl; discard solids. Whisk berry-flavored gelatin into juices and let cool slightly, about 15 minutes. Repeat cooking and straining using strawberries, remaining 1/2 cup water, and remaining 2 tablespoons sugar. Whisk strawberry-flavored gelatin into juices and let cool slightly, about 15 minutes. Using skewer, poke 25 holes in top of each cake, twisting gently to form slightly larger holes. Pour cooled blueberry syrup over 1 cake layer. Repeat with cooled strawberry syrup and remaining cake layer. Cover cake pans with plastic wrap and refrigerate until gelatin is set, at least 3 hours or up to 24 hours. Run thin knife around edge of pans. Invert blueberry cake, discarding parchment, onto wire rack, then reinvert onto platter. Spread 1 cup whipped cream evenly over top. Invert strawberry cake onto rack, discarding parchment, and place, right side up, on whipped cream, pressing lightly to adhere. Spread remaining whipped cream over top and sides of cake. Serve. Nutrition information per serving: 597 calories; 291 calories from fat; 33 g fat (19 g saturated; 1 g trans fats); 97 mg cholesterol; 658 mg sodium; 69 g carbohydrate; 1 g fiber; 45 g sugar; 9 g protein.